Don't be fooled by the cool January we have experienced, temperatures are warming up. Melbourne experienced it's coldest January in 10 years despite the initial couple of extreme heat days at the start of the month. 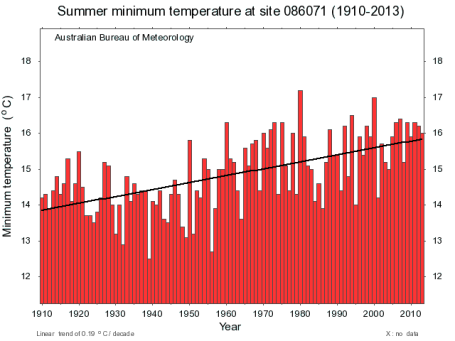 Although Melbourne's average maximum temperature of 25.9 degrees was the same as the long term average, the average minimum temperature was 1.6 degrees higher than the long term average. This article was originally published at Climate Action Moreland. 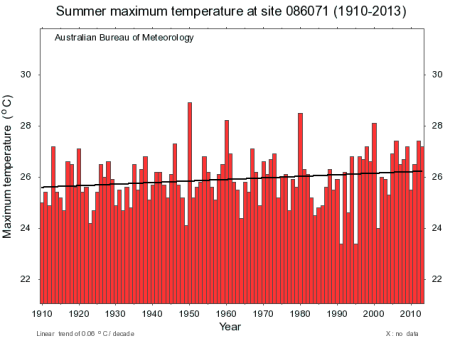 In previous years the average maximum temperature for Melbourne was 28.6 degrees in 2014, 27.3 in 2013 and 27.4 in 2012. The January average minimum temperature was 15.9 degrees, the lowest since 2005, and above the long-term average of 14.3 degrees. The start of January saw two Heat Health alerts issued by the Chief Health Officer: one for 2nd January and again on the 7th January. Read more about Victorian Heat Health alert system which is triggered when the daily average temperature is predicted to meet or exceed the threshold temperature for that region. For Melbourne it is 30 degrees. January also saw extensive periods of cloud cover that brought double the January average of rain to some parts of the state. While the rain is welcome, it also increases plant growth which can dry out and become fuel for bushfires. High temperatures and heatwave conditions are forecast to hit much of Australia and Victoria in the next week. Temperatures in the low and mid 30s and perhaps into the 40s for northern and western districts, are forecast over the weekend and early next week. This will provide good conditions for drying out all that extra plant growth making it more susceptible to burning. "'If you get two weeks of really hot weather, that will just burn off," Emergency Management Commissioner Craig Lapsley said, "It's dependent on the temperatures. If we have moderate winds every day, that will dry the landscape." reported the Age. Some of Victoria's worst bushfires have occurred in early February during extreme heat after previous extensive drying of the landscape. Keep cool, keep hydrated, and keep safe over hot periods. This applies especially to children, the elderly, and those with existing medical or psychiatric conditions. During business hours Moreland Council Libraries and public offices can be used for respite from the heat. How fast are we heating the earth? Copyright 2004-2016 - Creative Commons Non-commercial Attribution (CC BY-NC-SA 3.0 AU) - Takver. Picture Window theme. Powered by Blogger.